Home delivery is convenient. And you won't run out. If you commonly experience incontinence when you laugh or sneeze, you know how embarrassing it can be. Many people will wet themselves when there is excess pressure placed on the bladder quickly. Sneezing, laughing, and coughing are all conditions that can cause your bladder to quickly force out urine. The amount could be a little or it could be a lot of urine. It depends on how much muscle strength you have and if your pelvic floor muscles will be able to hold in the rest of the urine. Emotionally having incontinence can be a huge problem. There are many people that withdraw from all social events because they are so embarrassed by their condition. Then you have other individuals that actually start suffering from depression due to incontinence as it can cause you to be incredibly embarrassed about your condition. Many elderly individuals are subject to falls thanks to incontinence as it can cause you to have balance problems. Buying incontinence products doesn’t need to be a hassle nor does it need to be something that you are embarrassed about. Thanks to specialists that sell incontinence products you can quickly find the products you need with minimal hassle and you also do not need to worry about other issues like other people seeing them, getting to the store or having them be discontinued or out of stock. Plus there is no one at the stores who is knowledgeable. The disposable underwear is shipped discretely so others will not know that you are purchasing adult diapers and other incontinence products. The other thing is online stores give you so many options when it comes to buying incontinence products that you can easily find a great incontinence product for a low cost. You will have a large selection to choose from, some of which offer you the same feeling as the underwear you are used to wearing and others that are disposable and quite absorbent so you won’t need to worry about any type of issues with the underwear not catching the urine that leaks from your body. Samples to try before you buy. Avoid the costly mistake of buying the wrong product you can't return. Many people find that disposable underwear is easier for you to manage. You don’t need to deal with washing it and you also won’t need to worry about other issues as well like the smell that can linger in your underwear when you are wearing washable underwear. Adult diapers can be expensive depending upon how many you need to use. If you wear them daily, there is going to be a significant cost that will add up. You have to debate on what you can afford and if you should opt for the disposable underwear over the washable underwear. 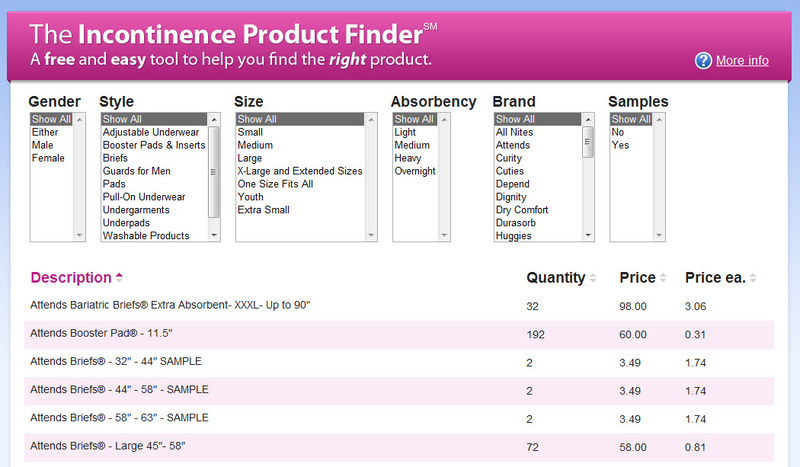 Here is a great link to help you find quality incontinence products that will work great to help you manage your problem: http://caregiverpartnership.com/category/12/. With disposable underwear you do have a large variety to choose from. You can opt for maximum protection by using overnight diapers or heavy diapers or you can choose to use the disposable underwear that is lightweight and is used just to catch small episodes of urine. Disposable underwear is beneficial at making your life easier and it is much more convenient than other products. The disposable underwear can come with scents along with fashionable styles that can help you mask your adult diapers so others won’t know that you are wearing them. To find quality incontinence products that will give you the ultimate in protection use this helpful product finder tool: http://www.caregiverpartnership.com/incontinence-product-finder/. Here you have a number of options to choose from along with quality washable wipes and other things that can give you relief from incontinence.